Specimens of blood contain high amounts of protein and lipid which tend to adhere to the surfaces they get in contact with. Over time, deposits accumulate and increase the general likeliness of clogging and contamination of the tubing system, while on electrode membranes they impair the quality of measurements. 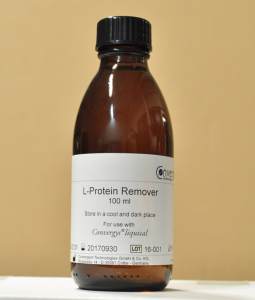 L-Protein Remover dissolves protein and lipid deposits on tubing and membrane surfaces, to keep the system in proper functional condition. We recommend using it on our Convergys liquical analyzers once a week or every 100 samples. Stored at 18°C to 25°C L-Protein Remover has a shelf life of 18 months from the date of manufacture.